What do you picture when you think of your ancestors? Is your family big-boned or petite? Quiet or loud? Hardworking? Dreamy? Large-nosed? It’s fun to think about meeting our ancestors some day. Who was the first Viking convert? The persecuted Catholic who kept the faith? The jerk who started the famous family temper? Every family has a unique history. In my family, we inherited a patrimony of poetry, alcoholism, itinerancy, wheat intolerance, curly hair, and story-telling from the Irish; from the Russian, love of home, hard work, and children. From the English, the stiff upper lip and the sovereign importance of tea. The good, the bad, and the ugly, the family wounds, the family traits. When the all-holy, immortal God became a man, he was born into a human family and inherited genes from his mother, his grandma and grandpa, and all his ancestors. He had family traits, family features, family culture. Do you ever wonder what these might be? I like to picture Jesus with the beauty of King David who was called “ruddy and handsome,” with a special authority and nobility from his kingly ancestry. He was also born into a home of carpenters. A craftsman, with hands and shoulders accustomed to lifting and build- ing. Above all, he was a Jewish man. He inherited a culture of legal observance, devotion to scripture, and holiness. “Shema, Israel…” Hear, Israel, the Lord your God is one! The words embedded in the doorway of every Jewish family, and inscribed on their hearts, ac- cording to the law. Jesus’ grandparents have a special place of honour in the Christian tradition. St. Anne and St. Joachim were Mary’s first teachers. What was their role? How did they form their little girl to be disposed to listen so attentively, beautifully, constantly, to the Holy Spirit, to “charm” God, as the early Church Fathers said? I like to think of St. Anne and St. Joachim as a typical Jewish family. They were Mary’s first teachers in the practice of prayer and the habit of obedience. From them, Mary would have inherited a culture of worship, the tradition of holiness which Yahweh had been cultivating in his people. She would have learned about the all-important “disposition of heart” which enabled Abraham and Joseph and her forefathers to hear God’s voice, as He protected them, led them to the promised land, and entered deep- er and deeper into intimacy with them..
Wouldn’t that be something to pass on to our children, a culture of worship? A love of scripture, a heart of re, and a listening ear? An intimate relationship with the Holy Spirit? 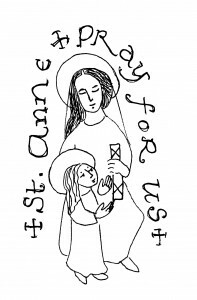 I’ve entrusted the education of my children to St. Anne’s prayers, because, while she’s not officially the patroness of home schoolers, she is, to me, the archetype educator. After all, she had an enormous responsibility. Much bigger than yours and mine. Although Mary was conceived without sin, all her perfection was just potential, a little seed. Somehow, it had to be watered, nurtured, pruned and taught. In my imagination, I envision St. Anne as a wise, Jewish matriarch—a little bit earthy, a little bit fierce, full of common sense. A young grandmother, with salt- and-pepper hair, making food for her family, counsel- ling them, bossing them around, loving them. Holy mother Church gives great honour to St. Anne, and St. Anne honours her adopted grand-children by showering them with miracles, blessings, and graces. I grew up next to a town that was nearly a ghost- town for most of the year, but perked up each summer around July 26 when hundreds of pilgrims would vis- it the shrine of St. Anne for her feast day. In secular, Protestant Canada, this was quite phenomenal. More phenomenal still was the plethora of conversions and healings, especially inner-healings, from the kindly St. Anne. I’ve felt her presence strongly in this last pregnancy. And why not? By baptism, we’re adopted into Jesus’ family. She is our adopted grandmother.